WSU’s Master of Science in Agriculture (MSAG) program is designed for agricultural professionals, practitioners, and educators who wish to gain knowledge and skills and boost their careers. The program’s flexible, fully-online format is ideal for working professionals who want to achieve their academic and career goals with continuing with their careers. 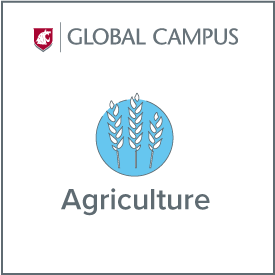 WSU’s world-renowned agriculture faculty are experts in animal science, economic sciences, food science, crop and soil sciences, horticulture, entomology, plant pathology, and more. The program provides a solid core curriculum in agricultural science focusing on valuable practical knowledge and skills for agricultural professionals. You will also be given the opportunity to direct your learning experience and tailor your coursework to help them meet your professional goals. MSAG students have the choice of the general MS in agriculture option, as well as options focusing on Food Science and Management and Plant Health and Management. You may also choose between a thesis or non-thesis program. Non-thesis program students can select either a traditional project-based option or an industry, immersion-based option involving a practicum/internship. An additional 20 graded credits minimum are required on the program of study. Six of these additional credits may be at the 300-400 level but the balance of these credits needs to be at the 500-level. Please visit Courses Available by Semester to view a list of program approved courses to determine (with your advisor) the remaining courses you wish to take in order to fulfill your program of study requirements. AGRI 702 Master’s Special Problems, Directed Study, and/or Examination: A minimum of four credits are required; you must be enrolled in 2 credits of 702 in the term of your final exam. Project and examination requirements are explained in the MSAG Student Handbook in detail. Background: Students should have a background in a related area, such as agriculture, plant science, biology, entomology, plant pathology, horticulture, or food science; or documented evidence of coursework or work experience in these areas. Without this relevant background, students may need or be required to complete 6 to 9 semester credits of prerequisite courses at the beginning of their degree program, and these courses may or may not be counted toward the degree program requirements. Please review your preparedness or concerns regarding specific coursework in advance with your advisor and/or instructor. Pre-Requisites: The registration system(s) does not recognize external transcripts in determining if prerequisites have been met. In these cases, students who meet the prerequisites may contact the instructor to request a prerequisite override exemption. Enrollment and Continuous Enrollment: Degree-seeking students must maintain continuous enrollment in the Graduate School by enrolling for a minimum of 2 credits per semester (excluding summer sessions). A student who is not on approved graduate leave or internship leave status, and who is absent for one semester or two consecutive semesters (excluding the summer) must complete the reenrollment form ($25) before the student can register for classes. A student not enrolled for three consecutive semesters will be dropped from the Graduate School. Thesis option: Enrollment in a MSAG thesis option is by exception only via permission of the MSAG director. The requirements are slightly different than the non-thesis option. The thesis option requires STAT 512 vs STAT 412, and AGRI 700 vs AGRI 702. The overall credit requirement for the thesis option is 30 (21 vs 26 graded credits, and 4-9 research credits). Only 6 vs 9 of the graded credits may be at the 300-400 level. Project and examination requirements are explained in the MSAG Student Handbook in detail.